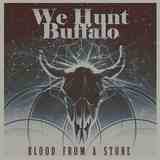 I just came back from a meeting with my hometown hockey team, which obviously has a lot of Canadians playing for it, and just remembered that I wanted to drop in a word for Vancouver, BC dwellers We Hunt Buffalo and their latest self-released EP Blood from a Stone. The music on the release is good and deserves your attention. Winners of some radio competition on the Vancouver radio, We Hunt Buffalo represent an interesting specimen, because they can still blow up your music stacks with Neurosis-style fuzzy sludge. The music is still dense and heavy, and guitar solos just ratchet up the pressure (Telepathic Eyes). At the same time We Hunt Buffalo prove that sludge does not have to be only dirty, that clean and grounded offshoot of this style also has the right to exist. They prove that stoner-like rocking grooves can actually sound pretty cool next to the grimy and ill-defined textures. They prove that dreamy and painful can rightfully coexist and harsh voice can flow into cleaner vocals on the bluesy Americana-tinged Hometown and Telepathic Eyes. If you come across the EP, don’t feel bad about dropping a few bucks to get your hands on it.